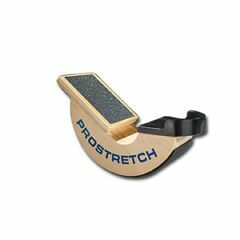 All the benefits of the ProStretch, the "Big Foot, is made of hand-crafted wood and is 25% larger than the original model. This version of the patented ProStretch conditioning and stretching devices is made of hand crafted wood and is 25% larger that original plastic model. Exercise each leg individually to improve flexibility and alleviate injuries to the lower extremities. Accommodates shoe size 14-21 Instruction manual and stretching DVD included. Is this product just for a foot size of 14 plus or can it be good for a size 12 also? Why is it better than the plastic version? Is this product better for bone spurs than the plastic version?